QE is, of course, the policy of central banks buying assets with newly created money. But where the money ends up makes a big difference. I am reminded of George Orwell’s Animal Farm, where all animals are created equal but some are more equal than others. Which further reminds me of Hillary Clinton, that paragon of equality and fairness. But I digress. I think I’m developing an obsessive response to the U.S. election. Japanese QE features the Bank of Japan buying equities directly from the market. That’s how they boost equity prices. The U.S. Federal Reserve buys bonds from the banks which drives down interest rates. The banks and securities dealers then lend this liquidity to corporations who buy back their own stock from the market. This has the same effect as Japanese QE except that in the U.S., the debt ends up on the balance sheets of the companies, not on the balance sheet of the central bank. So what, you may ask? Societe Generale’s Andrew Lapthorne writes that U.S. QE will ultimately prove “toxic” whereas Japan’s monetary experiment, while just as unprecedented, will confine its damage largely to the central bank’s balance sheet which means nothing to investors. In a market downturn, equity market losses will lead to the BOJ having to mark-to-market its equity holdings at a lower price. In the U.S., lower equity markets will lead to balance sheet disruption with inevitable job losses and cuts in already low levels of capital spending. In a low growth world, more corporate debt is dangerous; in a recessionary world, more corporate debt is toxic. Japanese companies understand this and they have used central bank policy support of equities to deleverage. U.S. corporates foolishly have done the exact opposite. 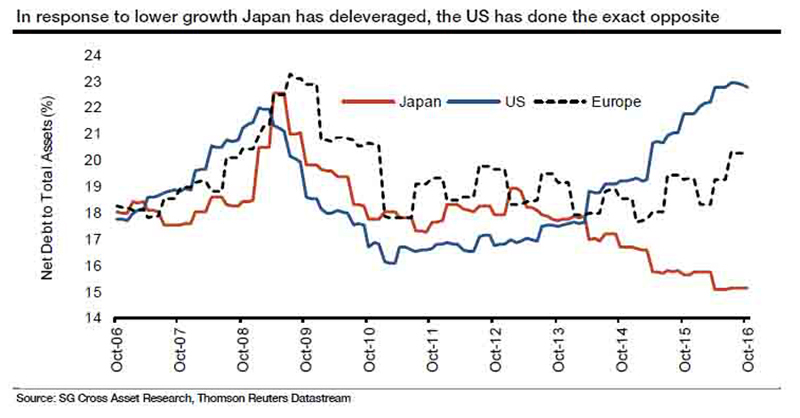 The chart below shows the divergence Lapthorne is focused on: deleveraging in Japan versus record high corporate leverage in the US. In the event of a recession, U.S. corporations will be forced into massive deleveraging, mostly through chapter 11 and other forced reorganizations which will likely wipe out years of equity gains from share buybacks and dividends. In Japan, the central bank will just cover its own write downs with currency it creates. Which brings me to an even bigger point: if for some reason, the leverage game is halted, either for public or private balance sheets, it’s truly game over, as the trillions in global debt created over the past seven years are the only reason why capital markets trade where they are, and perversely, this excess debt load is also the reason why global economic growth continues to deteriorate (as I have written previously). A reset of the unprecedented debt overhang is precisely what is needed to reboot economic growth. For a bankrupt to begin spending again, the old debt must be eliminated. However, for that to happen, much of the U.S. equity valuation will also have to be wiped out in corporate reorganizations. Therefore, I expect that the Fed will try other ways to prop up markets and stimulate growth before they finally let the bubble burst, even though their policies to date have proven to be a pro-growth bust. Next up? I’m betting on cold fusion in the U.S., no matter who wins the election. In case you don’t remember what cold fusion is, see my post of February 19, 2016.